I will explain to you what is the moisture content of wood and how to protect and conserve your racket. 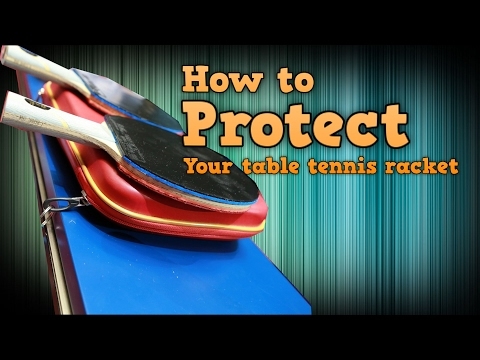 Your table tennis equipment is not cheap, and you should protect it. Normally, players just use plastic wrap, but it is not enough. Table tennis blade is the Bats without the rubbers. The blade is the most important equipment in table tennis, much more important than the rubbers. Table tennis blade is made from wood. Your table tennis blade is very sensitive to the humidity. As in many different industries that involve the use of wood, your blade will absorb humidity (moisture content of wood). And the humidity will soften your blade and make it less powerful. Many players protect only the rubbers by using the plastic warps (a thin plastic protector) (more info/ read review). But how to store your blade if you don’t play it for a long time? Not only use a plastic protector, but you should also add the silica-gel (more info/ check price) to the racket’s case. It will absorb the water and reduce the absorption rate into the wood. Another good tip: Never store a bare blade. Always cover, glue it with two old rubbers. Why? The two old rubbers react as the cover for the 2 sides of the blade. It will greatly reduce the absorption rate of humidity in the air. I’ve to conserve my old Stiga blade like that. And the blade still plays great even after 15 years. Your blade expands slightly and starts cupping or warping. You can also lose the feeling, the sharp feel of the blade. Up to a certain amount of moisture content, your blade is damaged. What is the moisture content and EMC? Why is it important to your blade? EMC is the amount of humidity absorbed by your table tennis blade (mass gained). It is directly related to the humidity and temperature of the place where you live! Look at the diagram. 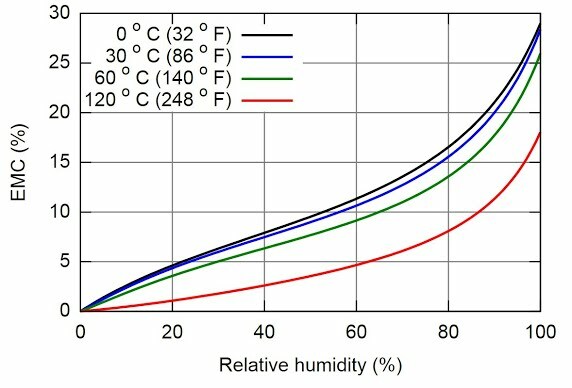 EMC depends on Relative humidity and the temperature. The blue line is the EMC for 30C, at 60% humidity, your blade will absorb about 10% of moisture. That means, if your blade weight is 90g, it will absorb about 9g. It’s huge! Remember, your table tennis blade doesn’t like water or humidity. Never put your blade in a plastic sack like this. I’ve seen many players put their blades in a sack. It’s wrong! The sack will cumulate and increase the humidity. Look at the top players, they just put their blade in his case without any additional cover. Because I understand well how important the effect of humidity, on the blade’s quality, personally I add the silica gel in the table tennis case to keep my racket in a dry condition. The wood quality of my blade is very good, it gives me a sharp and clear feeling even after several years. Avoid temperature extremes. Table tennis blades don’t like extremes of heat or cold. Don’t leave your racket on the dashboard of your car.Don’t put your racket in the luggage in the airplane, put it in the hand luggage. It’s very cold in the luggage carbine. In winter, don’t put your racket in the boot of your car. The quality of the wood decreases quickly. If you play Chinese tacky rubbers, you should read this “The truth about Chinese rubbers”. While playing TT, sweat coming from wrist and hand also get absorbed on the wooden handle,then does it also damage wood quality? And how should I clean my handle of blade . yes! water will absorb. But the handle wood is not the same as the blade surface wood. The playing characters of your blade won’t change. Don’t worry. Just play. I bought an old custom made Viscaria in China when I was visiting in a humid place, and it had very good dwell time, much better than Ma Long 5 at the same place. After I bring it back to California, the dwell time went down. I was thinking the dry air here made the wood harder. I was even thinking how to soften the top layer of the paddle to get more dwell time without damaging the wood. I actually been putting the paddle in a ziplock bag after playing, but the moisture from that is not making the paddle softer feel. So, I guess my problem is opposite from trying to keep paddle dry. I really want the dwell time I felt when I played in China, it was much better for looping and control even attacking. Another thought I had is that the humidity now is out of the paddle, it probably left the wood less flexible than before, it is little sad. Hi Jian. Water makes wood softer, but it will damage wood. (reduce the strength, and and damage the fiber). May be it comes from the rubber? In the US, it’s dry, and cold, so the rubber is harder? so you feel like this. But “blade doesn’t like water” it’s a rule. I recently purchased two expensive blades how do I store them without damage . I live in india where the climate is hot and humid . I have left the blades in the cardboard case that they came with but added two packets of silica gel . Is there anything I can do to store my blades when not in use ?